Our goal at guitarcleaning.com is to provide you, guitarists all around the world with accurate, effective, time saving ways to keep all your instruments clean and working properly. It is also a space where instrument techs can come together and share knowledge in the forms, or share their personal success/horror stories with everybody in the blog. Paul Reed Smith guitars are very finely built instruments. The guitars are built by musician for musicains, and this attitude is meticulasly reflected into their guitars. The story starts off the Paul Reed Smith built his fist guitar while at music college to challenge a professor for extra credit, and from here, the legend was born. Over the next 10 years they would refine the instrumet through playing it at gigs, and having other players gig the instruments, giving feedback to make the instrument into a beast. From here, Paul campaigned relentlessly around the concert halls to get a sale to some of the musicians, claiming “One night in ten I’d make a sale.” But, because of these efforts, he inticed such artists like Carlos Santana, and now has an exhaustive list including Dave Navarro, David Grissom, Nick Cantanese, and many many more. Seriously, the list is pretty big. After gaining the support of some big artists, Paul canvassed guitar shops up and down the country, returning with enough of an order to start his shop, building his team. 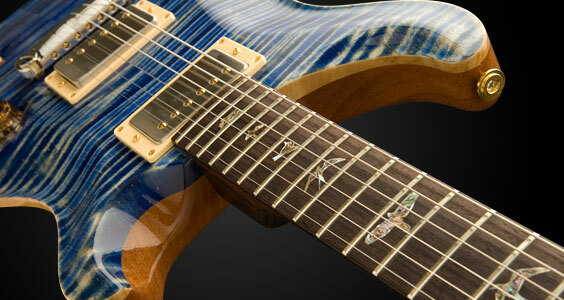 Today, PRS guitars are considered some of the finest instruments available. Their superior build, rock solid bodies, and signature bird inlays make it an instant collectors item. If you’ve ever had the pleasure to hold one in your hand, you understand it immediately. 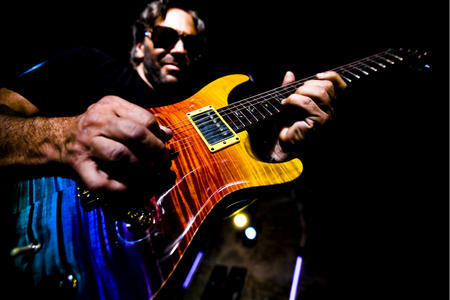 We have reviewed a few of the guitars such as the Custom 24, the 305, and the Hollowbody II.